At one of my talks I was recently asked about historical novels. A woman’s nephew, a student at high school, had been asked to choose an historical novel and he didn’t really know what the term meant. So how do you define an historical novel and what are some good ones? Historical novels must take place in the past of the author. They must pay attention to the manners, social conditions, political situation and ways of life of that past era. Some writers plonk their plots back in the past without any real knowledge of dress, speech and manners of that era (Barbara Cartland is a prime example of this), but better authors do their research and try to ensure that vocabulary, conversation, furniture and other aspects are all correctly described. It was Maria Edgeworth who got the historical novel up and running in Ireland with her 1800 novel Castle Rackrent. 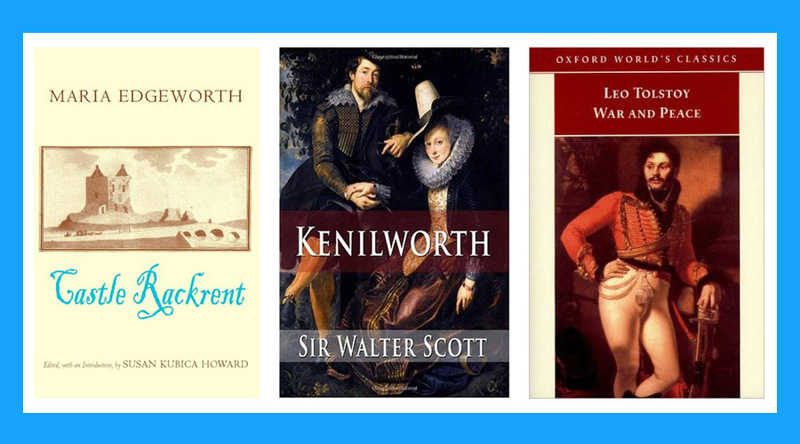 Then Sir Walter Scott learned from her and made the genre popular in Britain (and, as his books were widely translated, around much of Europe as well). His Ivanhoe, set in the Middle Ages, and Kenilworth set in the Elizabethan era, are prime examples of the genre. In France, it was Balzac who got the genre going, in America it was James Fenimore Cooper and in Russia, it was Tolstoy with War and Peace. 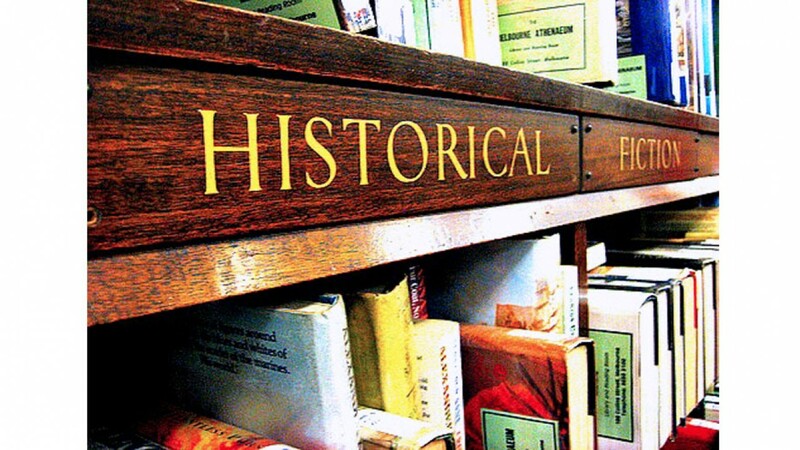 But how far back does an author have to go before his or her books can be defined as ‘historical’? The Historical Novel Society says it has to be a minimum of 50 years back into the past. The author should be writing from research rather than from personal experience. So Jane Austen did NOT write historical novels, but Emily Brontë did with Wuthering Heights, and so did Thackeray with Vanity Fair. Dickens wrote historical novels with Barnaby Rudge and A Tale of Two Cities, but David Copperfield and Our Mutual Friend are set in his own era and are not therefore historical novels. George Eliot’s Middlemarch was set in her own era so is not historical, but her rather poor book Romola, set in 15th C Florence, is an historical novel. Robert Graves’s I, Claudius is a more modern example, there are the Regency novels of Georgette Heyer, Patrick O’Brian’s Aubrey-Maturin series set in the time of the Napoleonic Wars, Hilary Mantel’s Wolf Hall and Pat Barker’s excellent Regeneration trilogy. Of course there are now historical sub-genres – detective novels set in the past (including my beloved C.J. Sansom’s books), historical romance fiction, historical adventure novels including Stevenson’s brilliant Kidnapped and C.S Forester’s Hornblower books, historical fantasy (including some Philip Roth books), and even historical comic and manga books. I have noticed a tendency amongst some readers to dismiss ‘historical novels’ as an inferior genre, and I find this extremely puzzling. Shakespeare set plays in the past so wrote historical drama, Tolstoy contributed to the genre, as did so many other great novelists. Surely it takes an added skill to not only write a good novel, but to set it convincingly in another era and to make your readers believe in those manners and times. Someone recently made a blanket statement to me that he wasn’t interested in historical novels and I have been trying, without success, to persuade him otherwise, but I am very puzzled as to this ‘shutting off’ of novels written in the past of the author. The woman who asked me about the genre at my talk was clearly puzzled by how one should define it, so I do hope that this helps any of you slightly confused (or dismissive) of a truly fabulous genre. After all, Wuthering Heights, Vanity Fair, Lorna Doone, The Three Musketeers, The Count of Monte Cristo, Eugénie Grandet, The Leopard, the Flashman novels, The Scarlet Pimpernel, The Winthrop Woman, The Moonstone and many other favourites of mine all come into the category of historical fiction. And that’s not to even begin on all the historical crime I enjoy. Do you have some favourite historical novels? Have you ever stopped to think carefully about whether those books were written about 50 years before the time of writing, and what a difference that might make? Tell me your thoughts by leaving a comment. Historical novels have had a huge influence on my interests, hobbies and studies. As a child I devoured Rosemary Sutcliff’s excellent novels set in Roman Britain which sparked a lifelong interest in Ancient Rome. This drove me to choose Ancient Greek and Latin in High School and study Classics up to a PhD in Classical Archaeology. Her Medieval historical novels (as well as those by other authors) gave me -from a young age – an abiding love of cathedrals and castles. All four of my children read the children’s books I had kept and developed a love of history. I have advised students of classics to read Mary Renault as well as their text books to learn about Ancient Greece, read Lyndsey Davis to get a feel for daily life in Rome. Most of the detective novels I read are those which are steeped in ‘period detail’ with the murder mystery far less important! And, while I cannot stomach Romance novels, I make an exception for Georgette Heyer who brings Regency England to life so well. I totally agree that historical novels can teach you so much history and bring it alive. I love Lindsay Davis’s books about ancient Rome, and of course am a huge Georgette Heyer fan. But I missed the Rosemary Sutcliff ones you mention, but can well understand how good novels can lead you to study one particular era of history. I love historical novels! Where do I begin….the one that comes to mind at present is Matthew Reilly’s ‘The Tournament’. For people who think that Reilly’s fiction is cavalier and a bit brazen at times, this book reminded me of just how excellent a writer Reilly really is. His ability to depict character and manage pace is really quite clever. I have absolutely zero understanding of military history/ingenuity so most of the research he has done for novels such as his Scarecrow series have been completely lost on me but with ‘The Tournament’ set in Elizabethan times, an era I’m much more familiar with, I was singularly impressed by his depth of research. I haven’t read any Matthew Reilly, but I know my son-in-law loves his books. Thanks for letting me know about The Tournament – it sounds good and well researched. I too just love historical novels!!! into her own within the world of botany. It traces her life through adventurers, abolitionists, missionaries, astronomers, sea captains and geniuses. I thoroughly recommend it. I have read and greatly enjoyed the novels of Robert Harris, particularly his series about Cicero the Roman orator and statesman. His story, Cicero’s, is narrated by his secretary, a greek slave and evokes, for me, the atmosphere of Rome during the crisis of the republic. I am also a great fan of Martin Boyde’s series of 4 novels,the Langton quartette, based on his own family history. However, these might be disqualified under the 50 year rule.His novel Lucinda Brayford might just creep in. I greatly enjoy your lectures and this Blog. So glad you enjoy my blog and talks! I have also loved a couple of Robert Harris books, but have not read his Cicero ones, so must try them. I have never heard of Martin Boyde so will look out for his books – thanks for the recommendation.